Each shortcode has a default list type associated with it, all set up ready to go. In this case, I tried to provide simplicity and flexibility. To make it simple, there are a variety of pre-defined list types that are either usable as they are, or hopefully not too far from what you want. To make it flexible, you can override some of these settings in the shortcode and in the query string. This also allows one to play around a but more easily. To make it simple, there is some pre-defined “pretty printing”. For example, if you decide to print the RRULE (ics speak for the repeating rule), it will turn it into human speak eg: Daily on every Monday, Friday, Saturday. I challenge you to find a repeating rule that it cannot cope with! To make it flexible, there is a before and after html for each field, and each field has a css class assigned, so you can style your list or calendar anyway you like. almost all the possible fields that could appear in an ics file, grouped as the ics spec groups them. These are in UPPERCASE. For example: SUMMARY (the ics term) is the title of the event. Assume you have chosen the html style of a table. Then hopefully column is obvious? Except of course for column 0 (zero) – that means “do not show”. 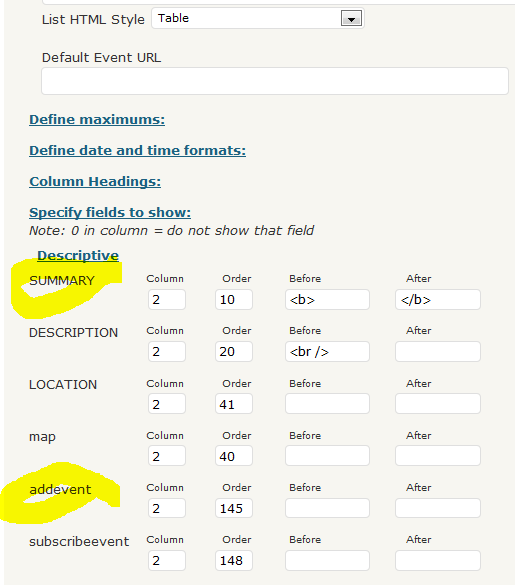 If not using the table html style, then think of a column as a means to group the data for an event. Say description and location in one ‘column’ and dates, times etc in another. The order you assign to a field determines the order or sequence within the column or group. What does column and order mean when working with a calendar box? I mentioned re-usable code? Well using the list type code that was already there meant that I could offer great flexibility in defining the content of your box calendar and how it should be displayed. the first ‘column’ – visible immediately, maybe for the event title and date and time? the second ‘column’ – only visible on hover over the event. You can put whatever you like here – maybe the description? 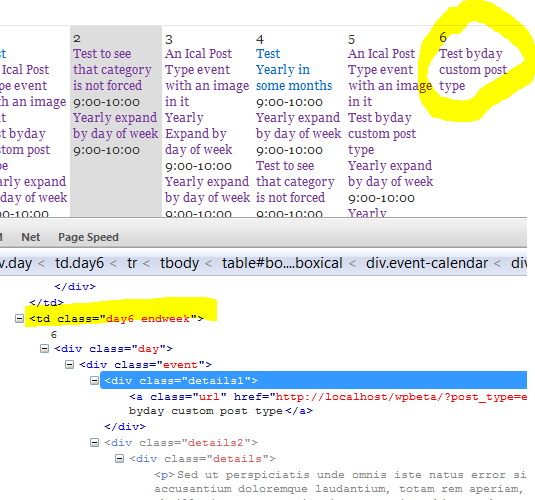 To make it flexible and still give valid HTML, div’s are used within the table cells. Any other html structure could result in invalid HTML if the you added your onw html.